In addition to Web-Based Email, you can get your email through a desktop client or mobile device. That’s it. On your device, go to Mail (it’s usually in the row at the bottom of your screen). If everything is working OK, you should see some email messages. To make sure you can send messages, go ahead and compose an email and send it to yourself. If you’re not receiving email messages or you can’t send messages, see iPhone: Troubleshooting Email. Don’t worry. There are a few things that can happen during the setup process. We’ll help you investigate and fix them. 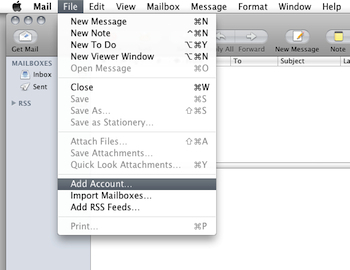 If the Welcome to Mail window does not display, select Add Account from theFile menu. 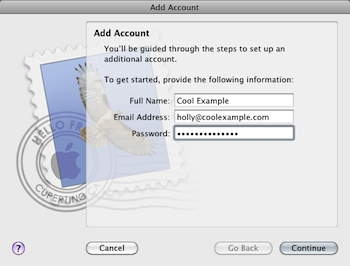 Account Type — Select POP or IMAP.NOTE: To use IMAP, your email account with us must support IMAP functionality. Description — A description of the email address to display in the email account list in Mail. 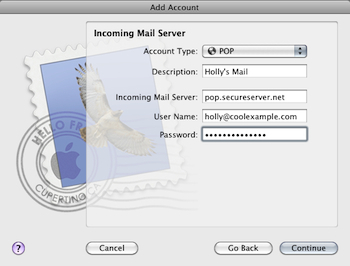 Incoming Mail Server — The incoming server name listed in InfoCenter. If prompted for Incoming Mail Security, select the following and then clickContinue. Description — A description of the SMTP server to display in the SMTP server list in Mail. Outgoing Mail Server — The outgoing server name listed in InfoCenter.NOTE: You must have enabled SMTP relays for your account in the Email Control Center. 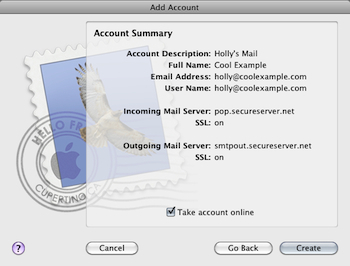 For more information, see Managing Your Email Account SMTP Relays. If prompted for Outgoing Mail Security, select the following and then clickContinue. That’s it. Go ahead and check your email. If you don’t see any messages, click Get Mail. To make sure you can send messages, try composing an email and sending it to yourself.